Hewlett-Packard on Tuesday took the wraps off a new, low-power server platform called "Gemini," the first implementation of which will use an upcoming Intel Atom processor code-named Centerton. 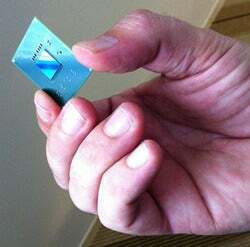 Early silicon of Intel's 'Centerton' Atom chip. Gemini servers will be targeted at workloads that don't need the muscle of a traditional server CPU such as an Intel Xeon and that run more efficiently when spread out across a large number of less powerful cores, said Paul Santeler, general manager of HP's hyperscale business unit, at a press briefing. Those workloads include serving up Web pages, big data analytics, running a distributed memory cache and server hosting environments where customers want dedicated rather than virtualized hardware, he said. For some of those workloads, a Gemini system will use as little as one-tenth the power and occupy one-tenth the space of a more traditional x86 server, according to HP. The Gemini platform won't be limited to Atom processors, however. HP offered few specifics about the platform Tuesday but said it uses processor "cartridges" that slot in and can support different processor types depending on the workload. Future Gemini systems will be offered with ARM-based processors in those cartridges, Santeler said. That could mean chips from Calxeda and Marvell, though HP isn't saying yet. HP is developing the low-power servers under a project it calls Moonshot. It announced the first fruits of that project last year, the Redstone Server Development Platform, which used a chip from Calxeda. At the time, HP said the Redstone system would be released to a few big customers this year for testing, and it seemed likely that the first commercially available Project Moonshot system would be Calxeda-based. It now appears that Redstone may be a testing vehicle only, however. Gemini provides HP with a single server platform that can use multiple processor types, while the Redstone system supports only the Calxeda chips. 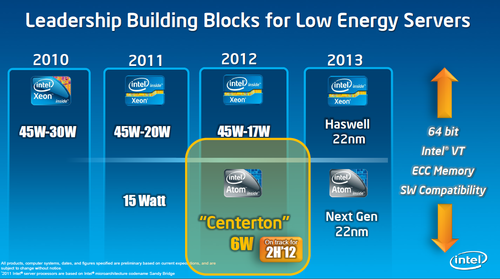 Intel's server chip roadmap includes the new Atom centerton processor, due this year. "With Gemini, we designed a server and a server infrastructure that will be relevant for many years," Santeler said. The first Gemini servers are being tested by customers in HP's labs and will go on sale later this year, he said. In the meantime, HP said it's running its Project Moonshot website on a Gemini system. One Gemini server handles 300 concurrent sessions in a 12- to 14-watt power envelope, while a Xeon system doing the same work would consume 150 watts, according to Santeler. Gemini gets its power savings in part through the low-power chips. Centerton consumes 6 watts of power, compared to between 17 and 45 watts for a Xeon chip, said Jason Waxman, general manager of Intel's cloud infrastructure group. Gemini also reduces power consumption through the use of shared components for functions like networking, management and cooling, HP said, though it isn't providing specifics. It would say only that one Gemini rack will have thousands of Atom CPU cores. Its secrecy reflects the level of competition in this new area. There's growing interest in building servers with many low-power processor cores as companies look to curb power use in their data centers. Dell is building low-power servers using ARM processors, and SeaMicro already sells servers with Atom chips, though it will likely switch to processors from Advanced Micro Devices, since it was just bought by that company. Intel's Atom chips were initially designed for mobile use, but like ARM processors, which also were built for mobile devices, the chips are finding a home in servers for workloads that don't need a lot of computing horsepower. Centerton is a 64-bit chip that includes several features usually found on server CPUs, including memory correction and support for server virtualization. Current ARM processors are still 32-bit and lack some of those server features, which may be partly why HP ended up releasing an Atom-based server first. Some server workloads will run on a 32-bit processor but it's "very workload specific," Santeler said, noting that 64-bit ARM CPUs are in development.